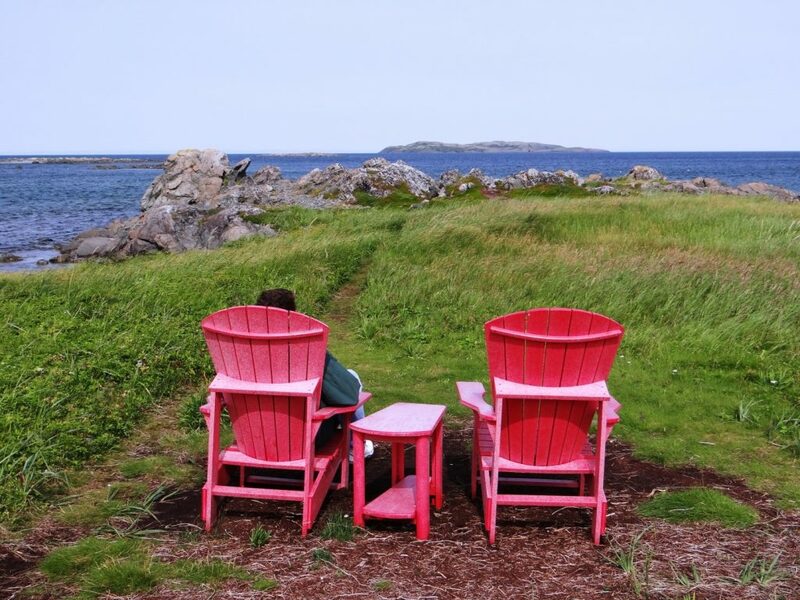 If you’re going to fly all the way to the end of North America to see the remote Canadian province of Newfoundland, there are two places you cannot miss. 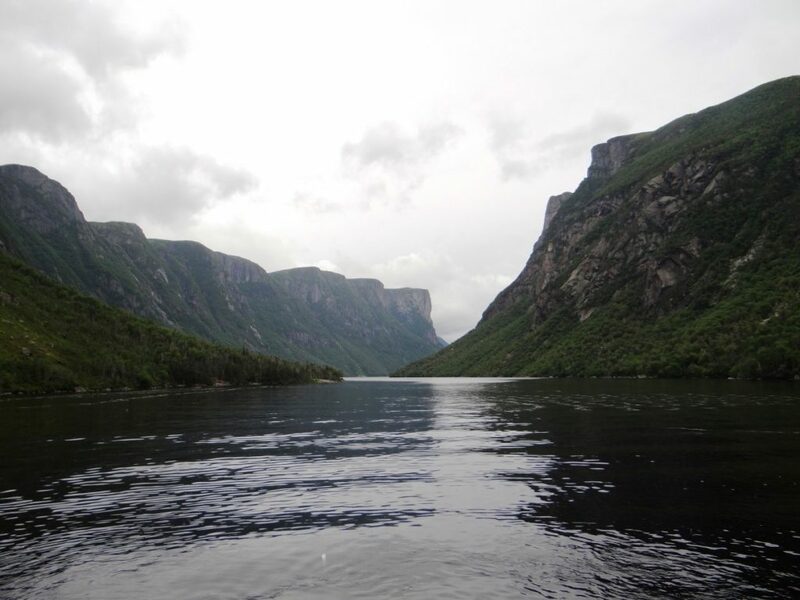 Gros Morne National Park with its mountains, fjords, and beautiful scenery. The Great Northern Peninsula with its rich Viking history, whales, and rocky coastal vistas. 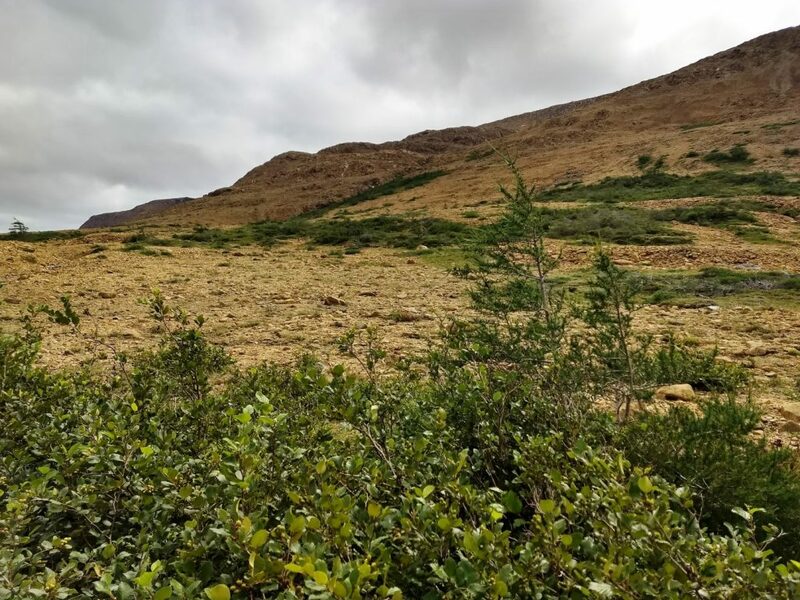 In my exhausting mission to journey across all of Newfoundland in just eight days, I dedicated two full days to each of these regions, both located on the western edge of Newfoundland. And while it is physically possible to explore both in just four days, I certainly recommend taking a few more days if you can. If you want to learn how I covered all of Newfoundland in only eight days, click HERE. Day One began with our first taste of Newfoundland cuisine at the Old Loft Restaurant, located in Woody Point on the picturesque Bonne Bay. One thing to understand about dining in Newfoundland – it isn’t gourmet. Folks here have been living off of whatever the seas, rocky soil, and harsh climate will provide. You won’t find fruit or spices. They just don’t grow here at this northern latitude. You will find cod fish, root vegetables and potatoes. Lots and lots of potatoes. We ordered Cod cakes with baked beans. 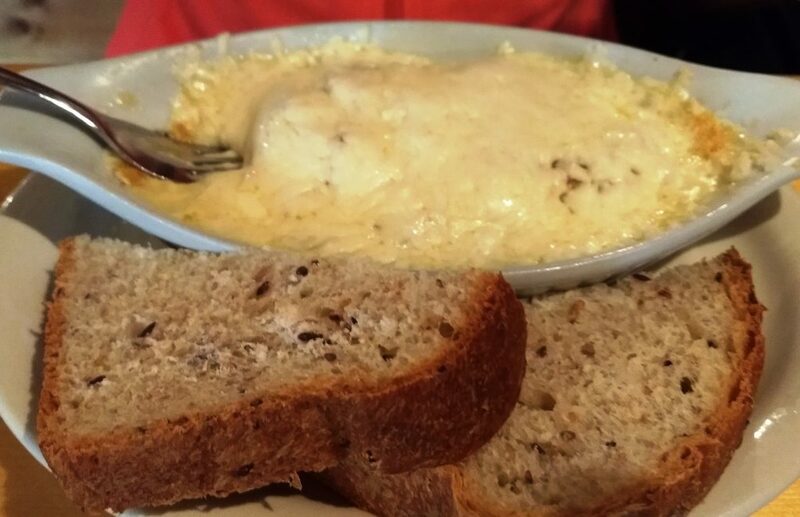 And Cod au Gratin. Neither dish was as interesting as it sounds. Cod cakes are salt cod mixed with bread crumbs, rolled into a ball and fried. Quite literally. I wish I could say there was more culinary flare involved… but no. Cod. Mixed with globs of melted cheese. Sorry, but that’s all it is. Both dishes were typical of the cod-centric, simple, hearty fare I found all across Newfoundland. We spent the afternoon hiking the moon-like terrain of the Tablelands, one of the rare spots on earth where you can literally walk on the earth’s mantle. Hundreds of millions of years ago when the continents collided, part of the earth’s inner core was thrust near the surface. A millennia of erosion eventually revealed this unique topography. With rock rich in iron and rusted orange by the elements, the Tablelands is just a short walk from the main road. Back in the car, we drove north to our hotel at the J&J Bed and Breakfast, part of the Shallow Bay Motel complex in Cow Head. We checked in early enough to grab dinner at an oceanfront table in the hotel dining room and watch the brilliant sunset over the Gulf of St. Lawrence. We also got to catch a performance at the renowned Gros Morne Theatre Festival, held at the Warehouse Theatre adjacent to the hotel. The Warehouse Theatre may look like your typical amateur community theater…but don’t let that fool you. Some of Canada’s best professional actors grace this stage every night of the summer to entertain a small, but attentive crowd of locals and tourists alike. The first night we saw “Outside Mullingar”, a smartly written, well-performed character study about a couple of introvert farmers living in modern rural Ireland. With so many Newfoundlanders having ancestral ties to the Emerald Isle, anything Irish themed is guaranteed to be a big hit, whether it is Irish music, Irish beer…or this insightful, funny play about the old homeland. The second night we saw “Ed and Ed Trapped,” a comedy about two fishermen struggling in the aftermath of the infamous 1992 Newfoundland “Cod Moratorium” which stripped the majority of Newfoundlanders of the only occupation they have ever known. Day Two was kicked off with the highlight of any trip to Gros Morne National Park — a ride on the West Brook II through the breathtaking Western Pond Fjord. Tens of thousands of years ago, glaciers carved deep gouges into the rocky landscape leaving behind crystal clear waters flanked by 1,000 foot sheer cliffs and waterfalls. A selfie here will convince all your Facebook friends that you splurged on a trip to Norway. We spent the rest of our day exploring the coves, lighthouses, and scenic overlooks of Gros Morne. There’s only one road up. And it’s the same road back. In fact, L’Anse aux Meadows, where the road dead-ends (it’s literally as far as you can go in North America), is the main reason I decided to come to Newfoundland. It was on this rocky desolate tip at the very end of Newfoundland – which is already the very end of the continent – where Leif Erikson, fearless leader of the Viking explorers, first set up camp in the new world over 1,000 years ago—500 years before Christopher Columbus. I’m still a big fan of old Chris Columbus, despite the bad rap he gets from modern progressives and Harvard college professors. I highly recommend a visit to La Rabida Monastery in Huelva, Spain (I’ve been there) where Columbus prayed and prepared for his voyage across the ocean blue in 1492. But I also thought it would be an unforgettable experience to stand on the very edge of North America—the place where the Europeans first set foot in the year 1000. Now granted, hopscotching from Norway to Iceland to Greenland to “Vinland”, as the Vikings optimistically called what became Newfoundland, isn’t quite the same as sailing 3,000 miles east into the unknown from the coast of Spain. Still, the Vikings deserve credit for an undeniably impressive step in human exploration. But it wasn’t until I watched the excellent intro movie at L’Anse aux Meadows Visitors Centre that the real magnitude of this spot sunk in. 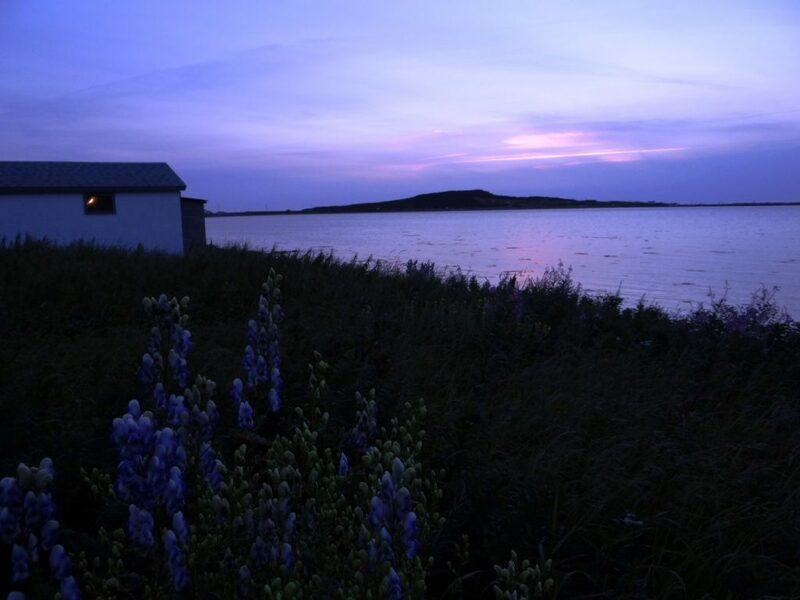 The film explained how L’Anse aux Meadows – a remote spot on the map – became the final step in the 100,000 year history of human migration. 100,000 years ago, our ancestors gradually moved out of Africa. Some turned left and populated Europe. Others turned right and migrated across Asia and eventually over the Bering Strait into North and South America. For 100,000 years, the vastness of the Atlantic Ocean separated these two groups of humanity — until the day the blue-eyed Vikings landed here and looked right into the dark eyes of the Native Americans. Thus, the circle of human population was completed at L’Anse aux Meadows. 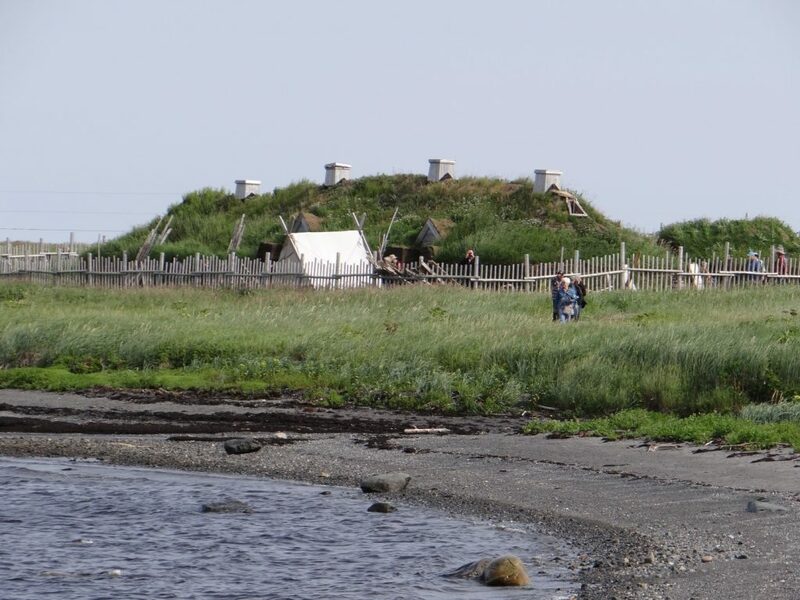 The L’Anse aux Meadows historic sight is divided into two parts — a recreated Viking village with actors reenacting life in a Nordic colony, and the archeological remnants of the actual village, now 1,000-year-old mounds of dirt and grass. But don’t leave without also taking the two mile nature walk across the rocky bluffs and bogs. They offer the most breathtaking views that make this 10 hour roundtrip to the top of Newfoundland completely worth it. Of course if you’re going to drive all the way up here, you want to do more than snap a few pictures of Newfoundlanders dressed in Viking garb or take a selfie in front of the Leif Erikson monument. So I made it into a two day detour and spent the night at the spotlessly clean Snorri Cabins just two miles from L’Anse aux Meadows. I recommend staying to see the ancient sea caves at Arches Provincial Park and its 650 million year old thrombolites, which are biofilm remnants of the oldest fossils on earth, as well as visiting the Fishing Point Lighthouse in St. Anthony. We even had time to take a Northland Discovery whale-watching cruise. And yes, I got some pictures of an actual humpback whale! Perhaps most surprising was the quality of dining on the Great Northern Peninsula. It was much better than the touristy places in Gros Morne. 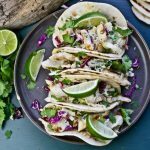 Both the Lightkeeper’s at St. Anthony and the Norseman at L’Ance aux Meadows offered top notch Newfoundland cuisine that matched the oceanfront views. The best breakfast we had on our entire trip was here at Northern Delight. I lined my stomach before a long day of hiking and rental car driving with fisherman’s brewis—a hearty mash of salt cod and softened hardtack. Trust me, it’s better than it sounds, especially when topped with porky scrunchions-tasty bits of fried pork fat. At the end of a long day of driving, we found ourselves back where we started 48 hours earlier at Gros Morne National Park. Sorry, there is no avoiding backtracking in Newfoundland. But that put us in Rocky Harbour just in time for the legendary “Anchors Aweigh” show at the Anchor Pub inside the Ocean View Hotel. 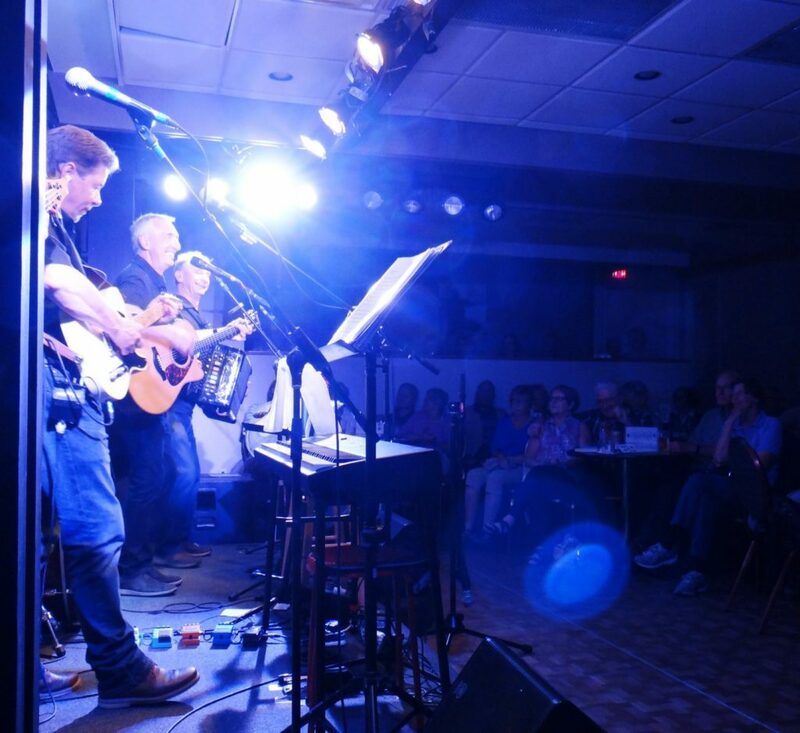 Anchors Aweigh is a super-talented band that’s been entertaining sold-out crowds with traditional Irish and Newfoundland folk music for three decades. You’ll laugh, you’ll cry, you’ll dance around with an “ugly stick”—a traditional Newfoundland percussion “instrument” made out of a mop and beer-bottle caps. You just need to be there to understand it. But you’ll want to book your reservation at least a month in advance. Busloads of Canadian tourists pack this place out every Monday, Wednesday, and Friday night. To continue following my epic eight day journey across Newfoundland, click HERE for the next round of sights we saw in Central Newfoundland!